Guest Post on WP User Frontend - Enable Unregistered Users To Publish! Users can post on your site without registering themselves with the powerful Guest Post on WP User Frontend feature. Navigate to wp-dashboard->User Frontend->Post Forms. Create a new form by clicking on Add Form or open an existing form of your choice from the list. You will see 3 tabs above the form: Form Editor, Settings, and Notification. Then click on the Submission Restriction page. 1. Click on the checkbox Enable Guest Post beside Guest Post. 2. Admins can choose to require users to enter their details by enabling the checkbox Require Name and Email address beside User Details option. This will automatically register users to your site. User has to enter his/her Name and E-Mail in the following fields: Name Label and E-Mail Label. Upon providing their details, they will be auto registered in your site as a user. Their email address will be used to generate username, if a user already exists with the same username, a random number will be appended to their username. If a user already exists with the same e-mail address, the post will assign to that existing user. 3. Admins can also choose to enable the Email Verification checkbox. This option will require users to verify their email address before they can make guest posts on that Post Form. 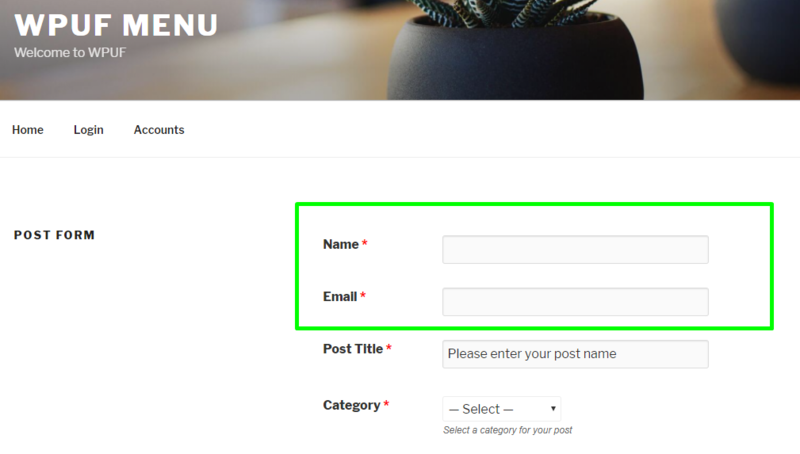 When you enable Guest Post with automatic registration, a Name field and Email field will be added to the form in the beginning allowing a user to register to your site instantly. When you enable Email Verification, users will receive email notification upon submission to confirm their email and publish the post they created. When user clicks on the given link, his/her post will be published on your site, and will appear along with other published posts. When you choose to select email authorization for guest posts, you would also need to set up the email that will reach your guest users. To do this, simple navigate to wp-dashboard->User Frontend->Settings. From Settings, open the E-Mails page. The first 2 fields are all that you need to configure the email notification for guest users. Guest Mail Subject: In this field, type the subject for the email verification mail. Guest Mail Body: Here, type the content of the email verification mail. After you are done, click on Save Changes at the bottom of the page.